Potential benefits using the natural orifices transluminal endoscopic surgery (NOTES) approach including advantages related to reduction of visible scaring, recovery time, hernia formation and adhesions have been evaluated over the traditional surgical approaches for the morbid obese population. Hybrid NOTES procedures (combination of laparoscopic and transluminal surgery) have emerged as an alternative in minimally invasive surgery. 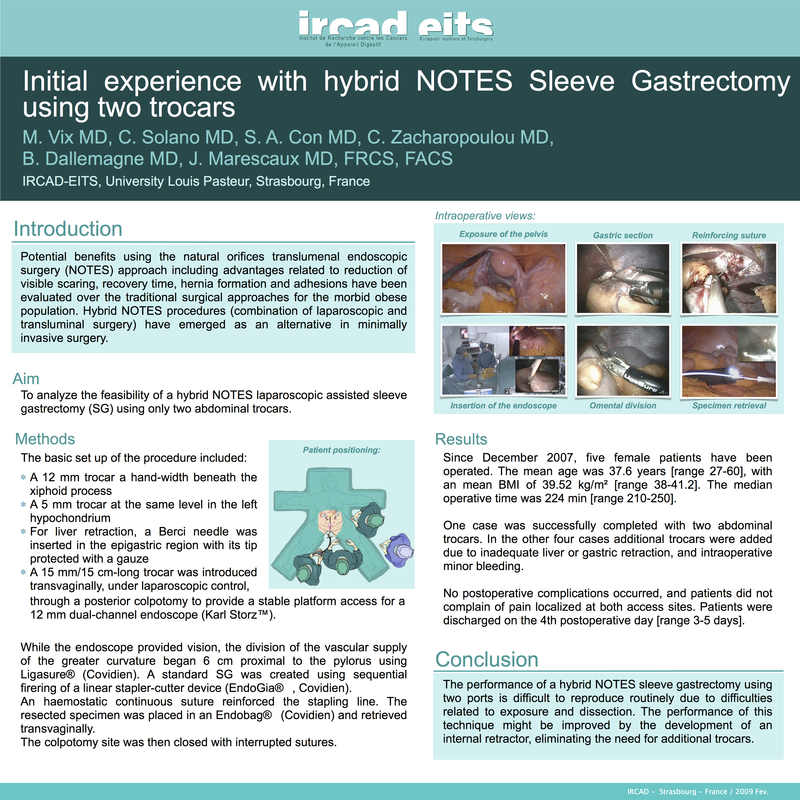 To analyze the feasibility of a hybrid NOTES laparoscopic assisted sleeve gastrectomy (SG) using only two abdominal trocars. The basic set up of the procedure included: a 12 mm trocar introduced by open technique a hand-width above the umbilicus, and a 5 mm trocar at the same level in the left hypochondrium. For liver retraction, a Berci needle was inserted in the epigastric region with its tip protected with a gauze. A 15 mm/15 cm-long trocar was introduced transvaginally, under laparoscopic control, through a posterior colpotomy to provide a stable platform access for a 12 mm dual-channel endoscope (Karl Storz™, Tuttlingen, Germany). While the endoscope provided vision, the division of the vascular supply of the greater curvature began 6 cm proximal to the pylorus using Ligasure® (Covidien). A standard SG was created using sequential firering of a linear stapler-cutter device (EndoGia™, Covidien). An haemostatic continuous suture reinforced the stapling line. The resected specimen was placed in an Endobag™(Covidien) and retrieved transvaginally. The colpotomy site was then closed. Since December 2007, five female patients have been operated. The mean age was 37.6 years (27-60), with an mean BMI of 39.52 (38-41.2kg/m²). The median operative time was 224 min (range 210-250 min). Only one case was successfully completed with two abdominal trocars while in the other four cases additional trocars were added due to inadequate liver or gastric retraction, and intraoperative minor bleeding. No postoperative complications occurred, and patients did not complain of pain localized at both access sites. Patients were discharged on the fourth postoperative day (range 3-5 days). The performance of a hybrid NOTES sleeve gastrectomy using two ports is difficult to reproduce routinely due to difficulties related to exposure and dissection. The performance of this technique might be improved by the development of an internal retractor, eliminating the need for additional trocars.